My grasshopper-like spacecraft exploring an atmospherically toxic planet at sunset. 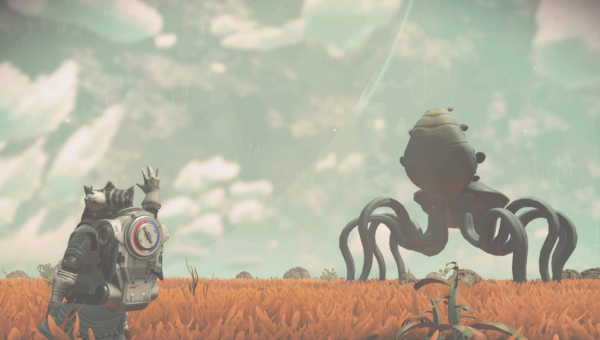 When the highly anticipated Hello Games video game No Man’s Sky released in 2016 as a Playstation 4 exclusive, fanfair was loud and dreams were big; procedural-generation, a method of creating data according to algorithms instead of manually inputting them, would allow each player to pilot unique spacecrafts and discover unique flora and fauna on unique planets in unique galaxies, theoretically forever… a truly unique feat. NMS was supposed to be so vast, more so than any other game before and after, that even though it was “technically” multiplayer, one may never come across another player. Ever. The curious nature of NMS, the sheer wonder of what one would find if they landed on that distant ringed-planet, is what fueled so much intrigue during the countdown to launch. So who is this audacious Hello Games, a relatively quiet and new company, and why would they embark on a mission of such magnitude? Founded in 2008 in Guildford, England, former employees of other big-time video game companies came together to start over and get back to the fundamentals of creating games. Prior to NMS they specialized in making “indie games,” which means they produced games without major funding and support from a larger company like Electronic Arts (one of the places some Hello Games employees left). They did this in part because indie games tend to be more on the creative side and more akin to old-school side-scrolling video games. The other reason, Hello Games only employs 16 people. SIXTEEN. In comparison, EA employs 9,300 people (as of 2018 statistics). 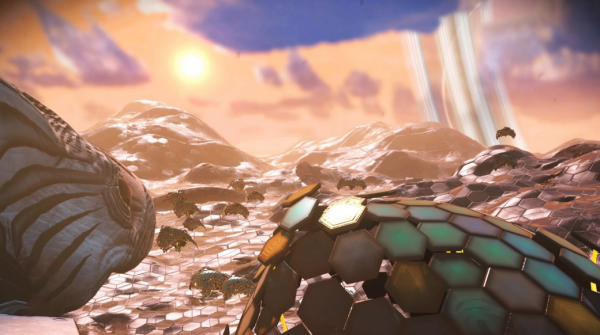 Ventures like NMS are thus unheard of for indie game companies because of the massive demand of resources for large scale games, even with a tool like procedural-generation. When gamers invested their $60 towards a brighter future navigating the stars, they were stunned when instead their money went straight into a black hole devoid of happiness. As I told the cashier at my local shop that I was picking up NMS he appropriately quoted the wise Admiral Ackbar. Indeed, sir, it was a trap. It was.The gaming community finally had hands-on experience and found more of a cheeseless moon than an Earth 2.0 or Mars. The excruciatingly simple tasks - traveling to a planet, harvesting some materials, and discovering new flora/fauna - it turns out got incredibly stale. The main storyline felt hollow, simple, and uninspired. It was also too short, something rather unforgivable for a game with such touted spaciousness. One of the saving graces was that tiny, insignificant chance that maybe, potentially you might come across another player out in the ever-expanding universes. Well, some gamers with incredible stick-to-it-iveness found out that that’s not actually possible due to coding (or lack thereof) that made each player invisible to each other. Despite wandering the same planet for hours and potentially standing right next to each other, no player-to-player interaction was possible. Some of the other broken light-promises (I call them that because I don't ever remember Sean Miller or any other Hello Games exec claiming some of these during pre-release interviews, but the gaming community recalls otherwise) included the possibility for building structures ala Minecraft or Fallout. Those light-promises were not met upon release. There are ways of tracking how many people are actively playing a game at any one moment, and they are used to determine a games popularity in real time. These stats don't usually surface for the general public because they generally follow the same arc, but in the case of NMS, by the time Houston realized it had a problem, the numbers proved it. 88% of NMS players worldwide put the controllers down and walked away like they just watched Apollo 13 in person. With such a failure most companies would do as the consumer did, or they would tweak the game in some downloadable content for another $30. Instead, to their credit, Hello Games listened to the gaming community and went back to work to create a series of free, literally game-changing, updates. Foundation was the first major update, and laid the… groundwork... for building planetary bases, as well as adding different game modes. Path Finder followed with three different types of vehicles (dune-buggy, hovercraft, and behemoth) to be used for planetary exploration and some extra storage. Included is another game mode titled PERMADEATH (without the caps lock ofcourse) - which plays exactly how it sounds - go until you die, then, well nobody has come back from that to tell us what happens after (perma)death… Atlas Rises arrived shortly after, reworking the main storyline and introducing new side missions, portals for traveling quicker between galaxies, new system economics and trade improvements, and joint exploration which directly leads to the next update. Next… (yep) is the latest massive update and finally made true on an original promise - multiplayer. Attached but not to be neglected is the ability to command freighter armadas and a graphics overhaul that everything look even better. By now I have spent about equal time playing the original version and the updated version with all of the new goodies (about 100 hours altogether). I tried my best to stick with NMS during the lean times; the beautiful landscapes of each planet and simple tasks created a peaceful escape from stressful everyday life. 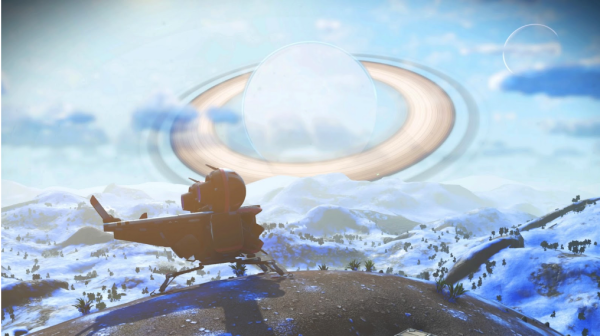 I would be dishonest, however, if I said I loved it just the way it was and didn't think about what more it could be.The updates that Hello Games made feel necessary and delivered so much more dimension and content than previously existed. I have never experienced a game like NMS, which blends perfectly the uniqueness of Minecraft with the beauty and wonder of a Sci-Fi movie poster. I’m excited to share all of this with my fellow gamers, and with Next, finally be able to meet up on Hoth (the ice planet I’ve colonized and named originally). With more adventures on the horizon, today NMS seems destined to be a title that will never be deemed an all-timer due to its rough start, but will instead be called something more special by its fanbase - stardust - for that unique feeling and quality No Man’s Sky possesses. I told you it’s grasshopper-like! This is Hoth (original) my colonized planet. This freakin planet was made entirely of hexagonal plates, reminding me of the “cob-planet from Rick and Morty.